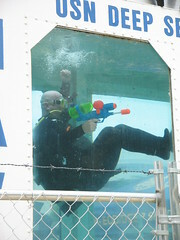 There was some kind of armed forces expo on the Mall yesterday, the Navy part of which included this diver in an aquarium, holding a squirt gun which he would occasionally poke above the surface of the water to rain liquid fun down on passersby with uncanny accuracy. Including me. Which was just awesome. 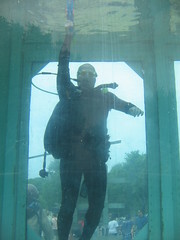 Navy Diver in a Tank, you rock. Also see my photos of the James Webb Space Telescope model on DC Metroblogging.